Mahmoud Abbas has had enough. Thirteen years into his four-year term as elected leader of the Palestinian people, he has nothing of substance to show for his efforts and his friends are abandoning him. On Sunday, his frustration was on full display during a two-and-a-half-hour speech. Things have been building up lately for Abbas and his Fatah faction and, at a meeting of the Palestinian Central Council, he finally let loose. Naturally, he focused on Israel, which he declared a European colonialist enterprise and denied Jewish connection to the land. Abbas, who has a doctorate in history, has taken a creative approach the discipline from the start, when his dissertation discounted the number of Jews murdered by the Nazis and contended that European Jews were collaborators in their own genocide in order to advance the cause of Zionism. Of course, Abbas also railed against the U.S. president for his announced intention to move the American embassy to Jerusalem. Abbas accused Donald Trump of destroying the prospects for peace. If the U.S. president is a notorious hothead, that’s exactly how Abbas appeared Sunday, but certainly not without reason. What must hurt more than anything is that Abbas now sees those who have been the Palestinians’ historic allies softening their resolve. As a New York Times investigation earlier this month indicated, while Arab leaders from Egypt to Saudi Arabia were making appropriate noises in public about Trump’s Jerusalem gambit, behind the scenes they are giving every indication that they won’t expend political energy on the matter. The irony is clear – and for Abbas and his allies it must be especially painful. The welfare of Palestinians has never been a genuine priority for the Arab world, even as they have propelled the Palestinian cause to the top of the global agenda, paralyzing the United Nations in the process. For Arab leaders, Palestinians have always been little more than a battering ram with which to land blow after blow against the Zionist entity. Palestinian life under Israeli occupation and autocratic leaders is filled with small and large indignities. Now that geopolitics suggests Israel is not so much the regional threat that Iran poses, the Palestinians, once a useful weapon for the Arabs in their 70-year confrontation with Israel, are being cast aside. Abbas’s obvious frustration Sunday suggests there may finally be a change afoot to the status quo that has been unsatisfactory for Israelis and even more so for Palestinians. What the future looks like for the Palestinians – and for their relations with Israel – remains unclear. Note: The headline of this editorial has been changed. In the Jan. 19 newspaper, the piece ran as “Abbas rightly irked,” which misled some readers to think that we agreed with Mahmoud Abbas’s remarks. 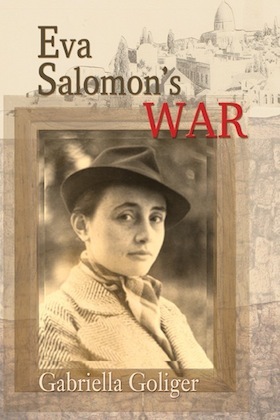 We in no way condone his abandonment of historical fact, his inhumane accusation that Jews were complicit in the Holocaust or the many other false and immoral statements in his two-and-a-half-hour diatribe. “Israel loves Iran,” “Palestine loves Israel,” “Israel loves Palestine,” “Iran loves Israel & Palestine.” The Peace Factory uses social media to connect people in the Middle East, to build relationships and see one another as human beings with visions of peace. Arce, a University of British Columbia film studies student from Mexico, recently began ACD with the goal of combating discrimination through meaningful, respectful dialogue and interactions. ACD’s Make a Friend, Make Peace event on Feb. 6 featured a presentation from the founders of the Peace Factory: Ronny Edry, an Israeli graphic designer living in Tel Aviv, and Joana Osman, a Palestinian living in Munich. The pair also spoke at King David High School. Israeli graphic designer Ronny Edry sent this poster out in 2012, when Israel was considering a preemptive strike against Iran. The graphic designer decided to send something else to Iran. He designed a brightly coloured poster with a photo of him holding his daughter and bold text declaring, “Iranians / we will never bomb your country / We ♥ You.” Edry told the audience that the “five first comments were ‘delete it’” but, after leaving the poster online, he was surprised to find that “Iranians were commenting on the picture” and a line of communication was created. Interestingly, the security guard of the ACD event, an Iranian-Canadian man, had participated in the Peace Factory movement. 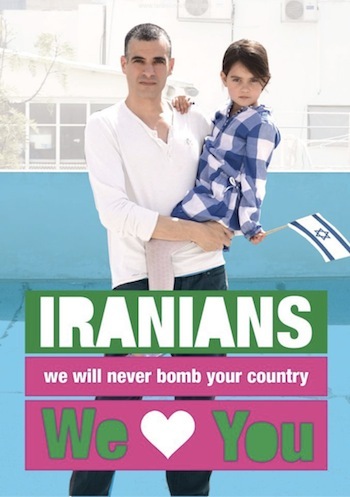 But, after starting the “Israel loves Iran” campaign, Edry received pictures from Iranians wanting to join. The movement has enabled many Iranians and Israelis to connect and build friendships online. And it continues to grow, with more than 121,000 likes and more than one million unique visitors each week to the “Israel loves Iran” Facebook page and more than two million views of Edry’s Ted Talk. The movement is continuing, with “both sides sharing stories and pictures of themselves,” said Edry. Soon after, Osman founded the group “Palestine loves Israel” to create a platform for Palestinians and Israelis to get to know one another through social media. The Peace Factory’s vision is of a free and democratic Middle East, and they intend to build bridges and friendships to connect people with the same vision. To learn more, visit thepeacefactory.org. Anyone interested in future ACD events can find out more at acdmovement.com. After a hostile greeting by protesters in the Palestinian Authority capital of Ramallah, who pelted his convoy with shoes and eggs, Canadian Foreign Minister John Baird returned to Jerusalem to meet with Israeli Prime Minister Binyamin Netanyahu, Foreign Minister Avigdor Lieberman and President Reuven Rivlin. According to reports, Ramallah activists carried signs reading “Baird you are not welcome in Palestine.” Baird has opposed the PA’s bid for war crimes charges against Israel and other moves by the PA at the United Nations. Ottawa has also been vocally supportive of Israel during Stephen Harper’s tenure. The foreign minister’s visit came on the anniversary of Harper’s tour of the region in 2014. Baird hoped to reaffirm Canada’s commitment to the strategic partnership and agreements forged on that visit. “Canada deeply values its close ties with Israel,” Baird said prior to his trip. Returning from Ramallah Sunday afternoon, Baird met privately with Lieberman. Lieberman has earned scorn with his plan to annex Israeli Arab villages to the PA. Under Lieberman’s plan, only those Arab citizens who moved to Israeli-controlled areas and pledged loyalty to the state of Israel would retain their current citizenship. Once considered a contender for prime minister, Lieberman’s chances have been diminished considerably by recent corruption allegations. Business development between the two countries will be targeted specifically in the area of defence, security and cyber security, Baird said. Canadian Ambassador Vivian Bercovici and other official representatives from both countries remained after Baird’s departure for award presentations to the 10 finalists of Grand Challenges Israel (GCI). Inspired by Grand Challenges Canada (GCC), which is led by chief executive officer Peter Singer, who received the Order of Canada in 2011, GCI rewards entrepreneurs for advances in affordable health care for the developing world. Finalists, chosen from more than 100 entries, presented innovations in water purification, disease diagnosis and an affordable wheelchair for children. Worldwide, the Grand Challenges initiative was launched by the Bill and Melinda Gates Foundation in 2003. Baird’s trip to the region included a stop in Egypt, which he visited prior to the Israel leg of his trip. There, he met with Foreign Minister Sameh Shoukry but failed to ensure the release of Canadian-Egyptian journalist Mohamed Fahmy, convicted for being a member of the Muslim Brotherhood, a group that is now banned in Egypt. A year ago, on Jan. 20, Harper became the first Canadian prime minister to speak in the Knesset. His remarks about Israel’s right to exist and defend itself received a standing ovation, along with jeers and catcalls from Israeli Arab MKs who walked out in protest. On that visit, Harper pledged millions of dollars in increased support for the PA. Although Harper’s visit was well received by the Israeli media, the Canadian press was critical of Harper’s large delegation and “rigid” pro-Israel stance. Baird’s Israel agenda originally included stops at the Dome of the Rock and the Al-Aqsa Mosque, both atop the Temple Mount area behind the Western Wall in Jerusalem. No reason was given for the decision to cancel visits there. Harper canceled a similar visit a year ago. Baird met Netanyahu on Monday afternoon before leaving Israel. He continued to Davos, Switzerland, to attend the 2015 World Economic Forum from Jan. 21-24.